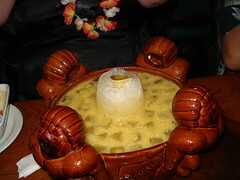 This is the Mai Kai. This is the Mystery Drink. It is served in the Mystery Bowl. It is presented Mysteriously by a Lovely Hula Maiden. This drink is being enjoyed tonight in celebration of birthdays. Several of them in fact. And if your birthday is about this time of year, Happy Birthday to you. You should go to the Mai Kai with all of your friends and order a Mystery Drink. I really love spending time in Dollar-Stores! The have the most interesting things that are obviously victims of questionable language translation. Take, for example, this blister-packed toy. Guy with Helmet, ready for action. Strange Wet-Floor type sign thingy with the image of a swimming stick-man. 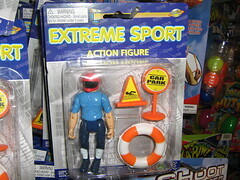 Hey, I'm sure parking cars near the water-sport complex is an Extreme Sport in the Country of Origin for this particular toy. 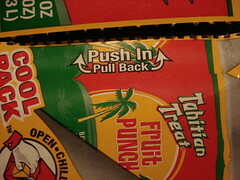 The Secret of Life as revealed on a 12 pack of Tahitian Treat. I mentioned in a previous post about the Easter Island Foundation and the fact that their website was not working..... well that's been fixed. The New and Improved website is up and running and I do hope you'll stop by and take a look. And, since your there, it would be kind of nice if you consider becoming a Member. 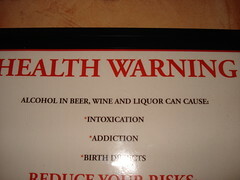 So it was the alcohol all the time and not the actual beer or wine or liquor. The scariest part is this is a rather large warning plastered on the wall in a Cheesecake Factory. And NOT next to the bar area! It was plastered next to the bathrooms. I really don't like the Nanny-State the lawyers are turning this place into.